Please refer to our stock # TI00497 when inquiring. This set looks like diamonds - I suppose because it is delicate and has both round and baguette rhinestones set in silver toned metal. The heart pendant is on a 16" fine chain. The heart is about 3/4" top to bottom, and the metal looks to be rhodium plated so that it looks like platinum. 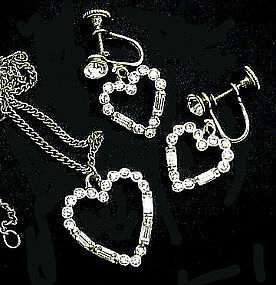 The matching earrings are screw back, and each one has a round stone on the ear and then a heart dangle. The earring hearts are just like the pendant - just smaller - about 5/8" top to bottom. The set is in excellent condition with no problems, and no marks.